Teach Iasc is perfectly located for exploring all the points of the compass. Enjoy great scenery, lively events and festivals, a warm welcome and some great days out and about. north, south, east or west… there is so much to do that we’ll have to leave you to do your own research, with a few favourites we can’t help but tell you briefly about. (If you already know why you’re coming to West Cork you need read no further!). 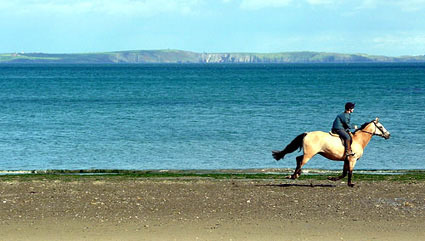 Head West for Barleycove – a treat of a beach with miles of soft sand and ideal for swimming, surfing or sea kayaking. Just a little way beyond, wave to America from the furthest point in Ireland – Mizen Head and then stop off at Crookhaven on the way home to enjoy the local chowder and seafaring banter. 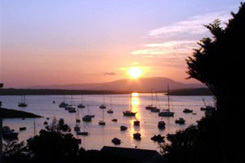 Schull is a good spot to do a little retail therapy for arts, crafts and gorgeous jewelry or to walk along the harbour front scoffing fresh fish ‘n chips or ice cream! 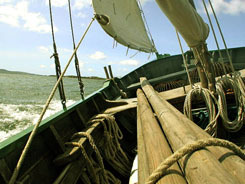 South – go by ferry boat to explore the archipelago of islands in Roaring Water Bay. Ferries go from Schull and Baltimore to Cape Clear – rich in Gaelic and reknowned for the story telling festival. Sherkin for the beaches of White Strand and musical nights. Heir to sample a delicious meal in the small cottage run by John Desmond, a local artist and chef – book early though! 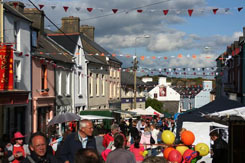 East brings you to the market town of Clonakilty winner of Tidy Towns and buzzing with music. Glandore home to sailors, good food and views and Kinsale, gourmet capital of Ireland, a very stylish harbour town also host town to the Kinsale arts festival. 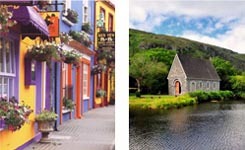 Go North over the hills into Bantry Bay famous for its mussels and first Friday markets then keep going for the wonders of Garnish Island, Kenmare and hope to catch a wedding at the tiny church in Gougane Barra. Naturally enough given the proximity to the water – sailing, surfing, kayaking, diving are all a great way to pass the time here – courses for these can be taken locally. One special mention has to be night time kayaking – an absolutely wonderful experience for all abilities. Or take a more gentle approach on a coastal boat trip and watch dolphins and whales playing alongside as you take in the scenery. Golfing, fishing, horse riding, walking, archaeological trips, even dirt and quad biking make it onto the list! Pampering (well who says this has to be all about action!) – West Cork offers an amazing range of alternative therapy opportunities from yoga to belly dancing, tai chi to reiki, homeopathy to osteopathy, indian massage to seaweed treatments. Go home glowing! Food is a big thing in this area with locally grown organic produce on sale both in the local supermarkets and the farmer’s markets, and if you need to improve your culinery skills cookery courses can also be part of your agenda. Due to the Gulf Stream the countryside here can best be described as ‘lush’ – it is a gardeners delight and the West Cork Garden Trail gives an opportunity to view the beautiful and diverse gardens in the area. …there really is too much choice and not enough room! And then there are all the other smaller festivals of music, art and all the country shows……. !